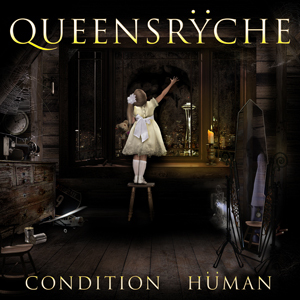 QUEENSRŸCHE’s anticipated new, full-length offering, Condition Hüman, is set for a release via Century Media Records on Oct 2nd. The album’s cover-art and official track-listing has now been revealed. Todd LaTorre (vocals) states: "The artwork depicts a beautiful innocence surrounded by the darkness of a jaded, unpredictable world." The new offering, Condition Hüman, sees LaTorre deliver the performance of a lifetime on what is now his sophomore recording effort with the band. Produced by Zeuss (ROB ZOMBIE, HATEBREED, SANCTUARY) in the band’s native Washington, Condition Hüman is a new mountain towering over many of the peaks and valleys of the hard rock landscape. The epic album opening track, “Arrow Of Time”, can be heard now below. Also, don't miss QUEENSRŸCHE on tour as direct support to the legendary SCORPIONS across North America from Sept 10th to Oct 9th. For all dates head either see below or head over to www.queensrycheofficial.com. The band’s name is uttered in the same breath as many of the groups they looked to as influences and others who arose as peers. QUEENSRŸCHE built a dedicated legion of fans traveling the globe on tour with fellow rock giants like IRON MAIDEN, GUNS N’ ROSES, METALLICA, JUDAS PRIEST and DEF LEPPARD. In recent years, they’ve consistently delivered high-octane live shows combining the hungry fire of a new band with the tempered experience of master showmen. Even with eleven gold and platinum plaques and a several Top 10 hard rock anthems woven into the very fiber of the genre, QUEENSRŸCHE won’t relent. In fact, they’re in the throes of a jaw-dropping creative resurgence.